I may be the luckiest of the 135 owners. I got into the Cobra Jet craze in 2005 when I asked a customer in our restaurant if he knew where I could find a nice Mustang Fastback. He told me to do some homework and find out what a 1968.5 Cobra Jet was. I read about them and ended up with a red/red 68.5 with 1,300 miles on the odometer. It was supposed to be original but the second owner was the original title holder so there was no previous ownership history. I took the car to the MCA National in Mustang, Oklahoma in 2007 and met the original owner by pure accident. He had raced the car only, never tagged it, and sold it with less than 300 original miles. This car led to a man from Tulsa calling and telling me he had a 135 car that he would like to sell and after one look I told him I wanted it. He told me he thought the car was possibly the Tasca race car because the Marti Report shows the car wasn't originally sold until April, 1969, but that car turned out to be car #042. This led to a lot of speculation and even more confusion. 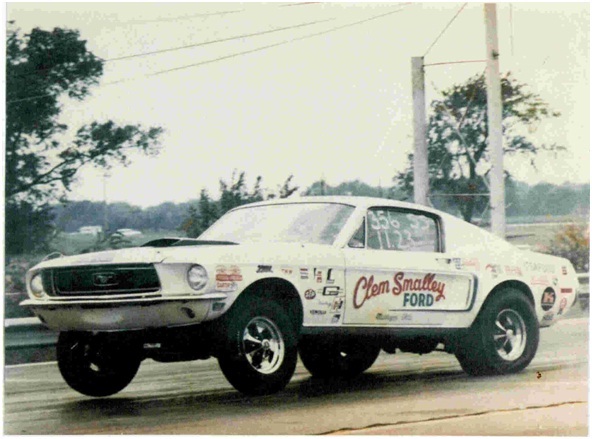 My father and I know the driver of the car, Willie Keifer, so we started asking him a lot of questions about it and he told us that Clem Smalley bought the car from Bob Tasca Sr. and it was supposed to have been his son's, Bob Tasca Jr. I left a message with Bob Jr. and he returned my phone call and wanted some more information on the car and after about a month, I got Bob Jr. and Willie on the phone together and they had it all figured out in 15 minutes. He confirmed that it was his old car. This was the car that Bill Lawton did the exhibition runs in, and also the same car that Mario Andretti ran in an exhibition race in Connecticut in May of 1968, just 4 days before the Indy 500. In old magazines and books this car usually has a 427 dual quad, a black hood and C stripe, and an antenna to make it look more like a regular production Mustang. The car was raced by a number of drivers: Clem Smalley of Muskogee, Oklahoma in the summer of 1969, and Willie Keifer who raced in Ft Smith, Arkansas. The car went on to race in several big races against Ed Terry, Ken McLellen, Bob Glidden, and Barry Poole. It held the NHRA Top Speed record at 124 MPH for about a year in 1970, which was set in Tulsa at the Spring Nationals. The car has never been titled in Oklahoma and has had several owners in the Tulsa area. The car was raced until the mid-80s so it has been tubbed, a roll cage added, and has electric fan, fuel pump, and ignition. The body is in great condition, always stored inside and never wrecked. The interior is mostly original but the rear seat is missing. Car 041 is pictured at a local drag strip years ago.